We occasionally have a bow that comes out at the wrong weight for a customer, if this happens we will display it here. 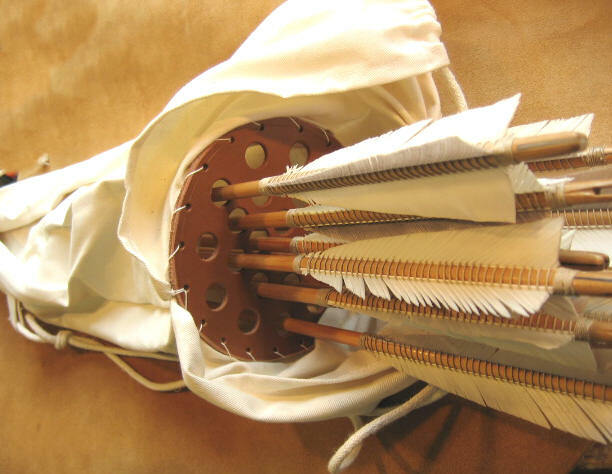 This excellent handmade Arrow Bag holds 24 Arrows, as you can see from the images above it consists of a leather spacer, as found on the `Mary Rose` with a tube of material tied at the bottom. There is a drawstring for the section at the top which covers the nock end of your Arrows, it also has a carry strap for shoulder use. blade 3 3/4" tang 1 3/4"
blade 3 1/2" tang 1 3/4"
blade 12" tang 2 1/2"